The Moore Police Department has started a new Community Service Unit and is available to help solve community problems that may arise. Please feel free to call me anytime at 405-793-4661 or email me at roblein@cityofmoore.com. Thank you for your time. The Moore Food Resource Center is open today for normal hours and is accepting affected families as well. 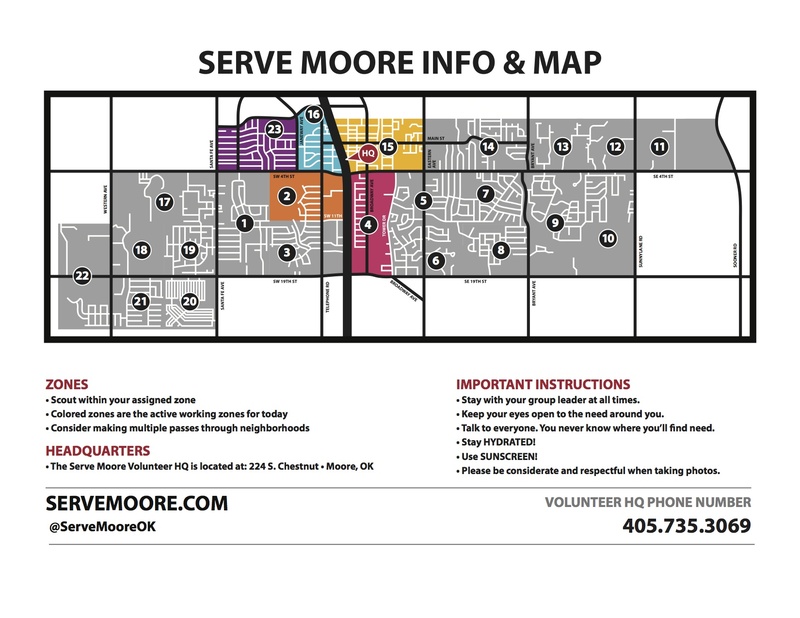 Serve Moore is working with Moore schools, City of OKC and City of Moore emergency mgmt to get volunteers out to the affected areas (see attached map). Volunteers are working on damaged public property today and will send additional assistance to residential areas over the next couple days. They will contact registered residents ahead of time to confirm. If you have any questions you can call us at 405-735-3060 or contact us on our Facebook page.Affected families are welcome to contact Serve Moore or visit the Community Renewal Center (224 S Chestnut). Visit servemoore.com or call 405-735-3060 for more information. OKUMC: Moore First Methodist VRC up, accepting Methodist volunteer teams call 405-388-5589. Home owners of all backgrounds can call for assistance 405-568-9935 or 405-445-2577. Accepting donations of OSB and tarps and have available furring strips, tarps, OSB, and volunteers; home owners can pick up flood buckets.